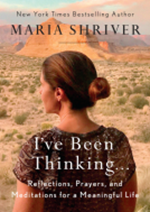 BOOK GIVEAWAY: Maria Schriver's "I've Been Thinking..."
Back in 2000, I purchased Maria Shriver's book Ten Things I Wish I'd Known - Before I Went Out into the Real World. It was a great book and I always wished she published more. Well, fast forward to today. The best selling author has released a new title. I’VE BEEN THINKING… tackles big issues like faith and family and finding your path; it stresses the importance of being present, hitting pause, saying thank you, listening, and telling your story. Shriver shares tales from her own life, including the guidance her mother gave her, how it felt to send her youngest off to college, and what she has learned about handling the curveballs that life throws your way. I am giving away ONE COPY of this book on Instagram! Please see my current post on Instagram for instructions on how to enter. Good luck to all who enter. ABOUT THE AUTHOR: Maria Shriver is the mother of four, a Peabody Award-winning and Emmy Award-winning journalist and producer, a six-time New York Times bestselling author, a tireless Alzheimer’s advocate, and an NBC News special anchor. When she’s not thinking or writing, she can be found hanging with her kids.